The Kelly Country Pick celebrates its 15th year in Beechworth from the 15th to the 18th August this year. 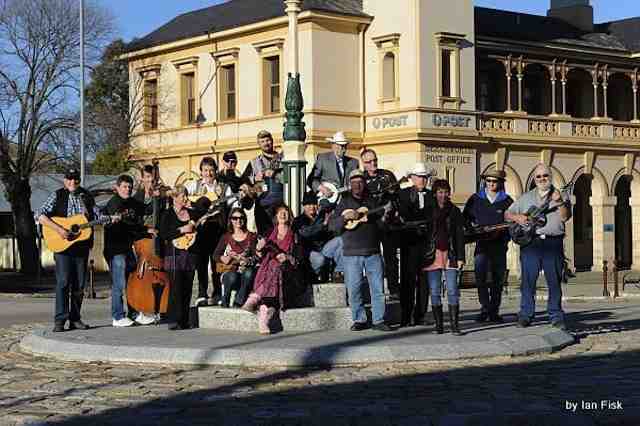 The Kelly Country Pick Bluegrass, Old time and Cajun music festival, has been a regular feature in Beechworth each year in August. This year the festival celebrates its 15th birthday with another superb line-up of performers coming in from all over Australia. Western Australia’s Bluegrass Parkway, will be featured at the festival for the first time, performing concerts on Friday and Saturday night and running workshops Saturday and Sunday. Workshops will include mandolin, double bass, bluegrass fiddle and single mic performance techniques. Maria Duff on the double bass, not only plays bluegrass, she also spent many years with the Perth Symphony Orchestra. Bands heading to the ‘pick’ this year are coming from nearly every state – Coolgrass, Cat and Clint, Johnny Can’t Dance, Fruit Jar, John Flanagan and the Begin Agains, High and Lonesome, Appalachian Heaven, High Times String Band and the Rusty Pickers are all from various parts of Victoria. The Kissin’ Cousins are flying the local Beechworth flag. The fabulous Breaking Hart Benton are returning from Brisbane for the second year running. Ray Marshall and his Deputies and Burnt Creek Deviation are heading down the Hume from Sydney and Wollongong and the Cherry Pickers are coming east from Adelaide. A packed weekend program is planned from 15th – 18th August, featuring concerts and open mic sessions in four iconic Beechworth venues – The Hibernian, The Nicholas, Bridge Rd Brewers and the Old Priory. 18 different workshops will take place at the Old Priory on Saturday and Sunday morning. These are aimed at musicians and non-musicians alike across a broad range of instruments including banjo, guitar, Dobro, fiddle and mandolin. For those who don’t play instruments there is harmony singing, Cajun dance and clogging. Luthiers will be on site, displaying and selling hand made acoustic instruments. A variety of ticket options are available – from weekend and day/evening passes to individual concerts or workshops. The Kelly Country Pick Bluegrass, Old time and Cajun music festival, returns to Beechworth in August to celebrate its 15th birthday with another superb line-up of performers coming in from all over Australia. Australia’s favourite bluegrass band Bluegrass Parkway, will be featured at the festival for the first time. They will be performing concerts on Friday and Saturday night and running workshops Saturday and Sunday in mandolin, double bass, bluegrass fiddle and single mic performance techniques. Maria Duff on the double bass, not only plays bluegrass, she also spent many years with the Perth Symphony Orchestra! Bands heading to the ‘pick’ this year are coming from nearly every state include Coolgrass, Cat and Clint, Johnny Can’t Dance, Fruit Jar, John Flanagan and the Begin Agains, High and Lonesome, Appalachian Heaven, High Times String Band and the Rusty Pickers are all from various parts of Victoria. The Kissin’ Cousins are flying the local Beechworth flag. The fabulous Breaking Hart Benton are returning from Brisbane for the second year running. Ray Marshall and his Deputies and Burnt Creek Deviation are heading down the Hume from Sydney and Wollongong and the Cherry Pickers are coming east from Adelaide. A packed weekend program is planned from 15th – 18th August– featuring concerts and open mic sessions in four iconic Beechworth venues – The Hibernian, The Nicholas, Bridge Rd Brewers and the Old Priory. 18 different workshops will take place at the Old Priory on Saturday and Sunday morning. These are aimed at musicians and non-musicians alike across a broad range of instruments including banjo, guitar, Dobro, fiddle and mandolin. For those who don’t play instruments there is harmony singing, Cajun dance and clogging. Luthiers will be on site, displaying and selling hand-made acoustic instruments. The Kelly Country Pick is turning 15 this year! The program is finalised and up on their website and being printed now. Wendy Jackson tells us that everything is in place for another fabulous weekend at Beechworth’s Kelly Country Pick. A few small changes in timing of a few concerts but generally much the same. There is an additional band in the line-up this year, hence a few concerts have 4 acts instead of the usual 3 to enable all acts to perform twice over the weekend. So, a chance for you to get out and about to see as much variety as you can. Out of 15 acts performing this year – 9 of them have never played the Kelly Country Pick before! Workshop schedule is also on the website and features tutors both new and old and a few new workshops to mix things up. Organisers are looking forward to having Maria and Paul Duff and the boys from Bluegrass Parkway in town all the way from Perth; new blood from Adelaide with ‘The Cherry Pickers’ and the return of the fabulous ‘Breaking Hart Benton’ from Brisbane. Lee and Michael are off to perform and record in Nashville following the festival. Mark Woods and Jack Jensen back on the job doing sound for the festival again and for the 4th year running. They will be working with 4 students from the audio production course at RMIT. Be sure to say hi to them and show your appreciation for their fine work. If you get to town early you re welcome to join the team for a relaxed early start this year with drinks and an open mic session at the Priory on the Thursday night. The registration desk will open around 4pm on Friday. If you haven’t booked your accommodation, click on the link here to go to our accommodation page. Don’t forget the Beechworth on Bridge is offering a special deal for the weekend which includes breakfast. A volunteer schedule has been dispatched, so if you are a current volunteer you should have received it by now and sending in your preferences. There is room for a few more volunteersd, if anyone would like a free pass in return for 6-8 hrs of assistance over the weekend. Check out the website’s volunteers page if you can help. Photos in use on the Kelly Country Pick website are courtesy of Ian Fisk and David Thorpe. Wendy Jackson has sent through an update on this year’s Kelly Country Pick with this year’s line up almost complete. The team is somewhat excited to have a whole host of new acts on board for 2012, and a number of performers attending the Kelly Country Pick for the first time from interstate. Early bird tickets can be ordered on-line at the website until the end of June. Early bird tickets cost $60. Post June, weekend tickets will be $75 at the door. Concession, day and evening tickets will also be available on the weekend. If you do not have capacity to buy on-line, you may pay by cheque – send your payment to ‘Kelly Country Pick’, PO Box 2292, Werribee, 3030. There will be no music camp this year but the Priory Hall will be accessible a day earlier to host a free open stage on the Thursday night 23rd August. So if you are thinking of coming early you can get started on the picking and partying before the masses arrive. The Saturday night this year will be at the Priory Hall with dinner and drinks available. There will also be a single mic Bluegrass Jam and an Old Timey Jam on stage at one of the venues. Details will be available when the programming is complete. There will be instrument displays as usual and luthiers are more than welcome to come and display and sell their wares. Like last year, organisers need volunteers to run the event and will provide free passes for approximately 6 hours of time over the weekend. Check out our volunteers page if you can help. The directors of the Kelly Country Pick, Wendy Jackson and Peter Hisco, are starting to gear up for their 2nd Kelly Country Pick Music Camp at Beechworth in Victoria. The Kelly Country Pick is a winter Bluegrass and Old Time Country Music Convention based in the historic town of Beechworth. Now in its 13th year, it attracts some 300-500 musicians and patrons. Organisers had a great response for the camp last year. They ended up with 36 people from a range of locations indicating that people are certainly willing to travel a long way to participate in an intensive learning camp. The idea for a camp came along last year by chance. We had spent a few months in Canada and the States and attended ‘Wintergrass’ in Seattle. We saw that many of the American festivals have intensive learning academies prior to their weekend events. I love the idea of immersing myself in an intense learning environment and having the chance to really try and move my playing to the next step. From this sprang the idea that maybe we could put on our own camp, prior to the Kelly Country Pick – Wendy Jackson. This year, Wendy and Peter have been back to the US, where they have just spent a week at the award winning Steve Kaufman Bluegrass Camp in Tennessee with about 400 other pickers. They’ll be bringing back a host of ideas to help make this years camp even better than last year. The camp this year has been extended by a day, to now start on the Tuesday and going right through to Thursday night. They will be a small break to allow everyone to prepare for the weekend festivities starting on Friday night. The camp camp program will also extend into the evenings and include a performance component this year. The folks from the Kelly Country Pick would like us to remind everyone that they are moving to a fully ticketed event this year. All venues, including the hotels will be ticketed for all shows. Early Bird Weekend tickets, which gives you access to all events, can be purchased online for $60 until the end of June. After 30th June, weekend tickets will be $75 either online or at the door. Concession, day and evening tickets will also be available on the weekend. If you do not have capacity to purchase online, you may pay by cheque – send your payment to ‘Kelly Country Pick’, PO Box 150, Kingsville, 3012. We are still in need of volunteers. This year more than ever before as we have to man the doors, sell and check tickets at our venues in town. If you can manage to give us approximately 6 hours of your time over the weekend, we’ll provide you with a free ticket. Check out the volunteers page on the Kelly Country Pick website if you can help. Booking numbers are steadily growing for the 2nd Kelly Country Pick Music Camp. If you’re thinking you’d like to do some intensive work on your instrument, why not join us for 3 days of musical support and friendship with expert tutors coming from near and far. Cost for the 3 days is $375, with a fully packed program of classes to choose from across all the bluegrass/ol timey instruments. We would hope to have numbers confirmed by the end of July to finalise programming detail and engagement of tutors. If there is someone you think might be interested, please forward on the details. 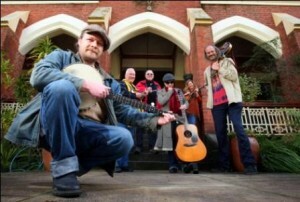 The Beechworth festival – Kelly Country Pick – is offering a music camp catering to all the instruments in the bluegrass/old timey genres. That is: guitar, mandolin, fiddle, double bass, bluegrass banjo, clawhammer banjo, singing and harmony. They may be able to cater for Dobro this year if there is a calling for it. The camp is aimed at the beginner and intermediate players, the camp is not for the total beginner. You must be able to change chords on your instrument to be able to benefit from intensive learning such as this. There will be a variety of multi-instrumental teachers tutoring who will rotate across different instruments. In addition to the classes held last year by request, the organisers are going to add more classes on singing harmony. They also plan a class on basic P.A setup and performance skills. Tutors in negotiation for 2011 – Kevin Parsell – guitar; Wendy Holman – bluegrass/clawhammer banjo; Mick Moffat – fiddle/mandolin; Wendy Jackson – singing/harmony; Peter Hisco – singing/harmony/double bass. More tutors to come – depends on numbers and instruments enrolled. The day’s program has been increased by 4.5 hrs to include catering for dinner followed by an open stage for students and tutor showcase concerts. All this makes for a big 3 days – hence finishing Thursday night, giving us all a chance to get our breath back before the fun starts again on Friday night. To reserve your place, email Wendy Jackson with details of the instruments you play and level (beg/int/adv) to wendy@kellycountrypick.org or fill in the form on the KCP website. Accommodation not included – can be arranged privately with the Old Priory. After receiving news of the Beechworth festival returning to the town of Harrietville last week, the question on most festival goers minds – and certainly the question raised in the bulk of our incoming emails is, what is going to happen to Harrietville. That is the new Harrietville? For those confused, the Bluegrass and Traditional Counctry Music Society of Australia, – BTCMSA – are the organisers of the annual gathering of bluegrass and old timey pickers which was held in November, in Harrietville each year. They had planned to move the festival location to Beechworth for 2011. Some folk, quite fond of the Harrietville experience, were not too enamoured with the idea of vacating Harrietville, and so another group of people planned for and put together an alternative gathering of enthusiasts to continue to meet in Harrietville in May this year. To avoid confusion, the new group chose to call the gathering The Great Alpine Pick – GAP – because BTCMSA chose to retain the name Harrietville in their branding for the new Beechworth festival. To add to the confusion, there is also another annual bluegrass gathering in Beechworth which is held in August each year called the Kelly Country Pick. This is the Beechworth to many, not the Harrietville Beechworth which, as it turns out, is now moving back to Harrietville. So instead of having two Beechworths, there will now be two Harrietvilles, one in May and one in November. See, not so confusing after all. We received this missive from The Great Alpine Pick organisers today. Harrietville is indeed moving back to Harrietville (confused? so was I). Alas the proposed venue at Beechworth (La Trobe Uni) is in the process of being closed and sold off, so Harrietville (the November one!) has been moved back to Harrietville. The Great Alpine Pick Organising Committee (the Harrietville in May) wish the Harrietville committee the best of luck and hope to enjoy another fabulous convention in November…. As for the Great Alpine Pick in May we’ve been pondering our decision on whether to go ahead or not for a little while as the reason of having this convention has sort of become invalid. But at this late stage we feel it unwise to pull out now… So keep your accommodation booked! keep your instruments tuned at the ready! We’re definitely going full steam ahead! In the next couple of days keep your eyes peeled on our website (www.greatalpinepick.net) or join our mailing list (maillist@greatalpinepick.net) for ticketing information and registration, as well as some more releases about the program and feature artists. If you think about it, you get the opportunity to experience bluegrass at Harrietville twice this year! That’s definitely not a bad thing at all. Hope to see you there in May – Angus. Planning for the 1st National Bluegrass & Traditional Country Music Convention of Australia is well underway according to organisers. As previously announced, the new venue is at LaTrobe, Beechworth, in northern Victoria with dates scheduled for 17th – 20th November 2011. 2011 is looking good with Old-timey guests from West Virginia and the return of champion fiddle player, Bobby Taylor along with Andrew Dunlap on banjo and John Preston on guitar. From North Carolina we’ll see Joe Thrift on the fiddle and John Riccio, of the legendary Red Hots, on the banjo. 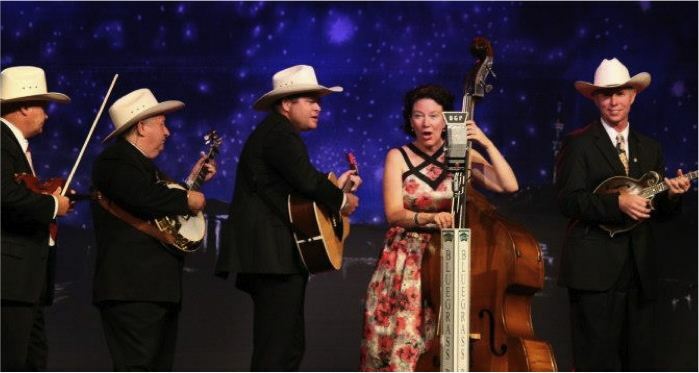 From Tasmania The New Holland Honeyeaters return by popular demand, with their fascinating Radio Stage Show on Thursday night, taking the country music story further into the 1940’s. Other acts for 2011 are still in discussion. 2012 is also looking good, as organisers have announced Audie Blaylock and Redline as the feature artists. Audie Blaylock and Redline are currently celebrating a #1 single, Cryin’ Heart Blues, on the January 2011 Bluegrass Unlimited Magazine’s Top 30 Song chart. The single is the title track from Audie Blaylock & Redline’s latest album. Accommodation & Camping is available on site at La Trobe, Beechworth. There are also a number of hotel style rooms with ensuite, rooms with shared facilities, 25 powered and numerous unpowered camp sites available onsite. Bookings at Latrobe can be made from late February. Onsite accommodation (including camping) will be limited to weekend convention pass holders. This new venue offers the perfect location for the family, friends & fans of Bluegrass & traditional country music offering convention facilities, accommodation and camping on site, and also near by in the historic township of Beechworth, Victoria – Rod Jones.